Move right into this beautifully renovated, approx. 1,437 sq. ft. 5-room 2-bedroom, 2-bathroom residence with separate home office, windowed kitchen, glass-enclosed terrace, and enjoy panoramic open city views from every room. This sun-flooded home offers generously proportioned rooms, and a meticulous renovation with no detail overlooked. An entry foyer leads to a large gallery, perfect as a formal dining room, and a separate home office. The expansive north-facing living room features oversized windows with wonderful, open city views, and beautiful built-ins and storage. Adjacent to the living room, a flexible room perfect as a second bedroom -- currently set up as the den -- has been expanded by enclosing the balcony within glass walls. This beautiful room with sunny North and East exposures is suitable for all seasons, and can open to fresh air during the warmer months. The modern windowed kitchen features Caesar stone countertops, custom wood cabinetry, and stainless steel appliances including a stove with built-in vented canopy, ice-dispensing GE refrigerator, and Fisher-Paykel dishwasher. There is a Miele washer & dryer, as well ample storage. The enormous corner master bedroom has oversized bay windows, and a 13'8" x 6'6" walk-in closet. The two bathrooms have been thoughtfully designed with glass-enclosed showers, and clad in Crema Marfil stone with new fixtures and hardware. Other features include hardwood floors throughout, custom lighting, built-in sound system, electronic shades with Lutron controls in every room, HVAC system with wall-mounted thermostat controls, and designer crown and baseboard moldings. 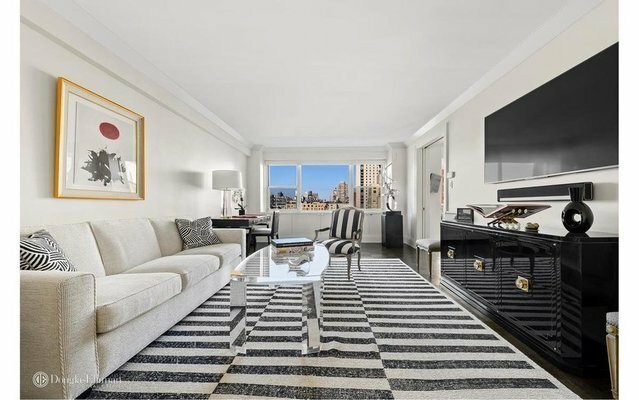 The Imperial House is a prestigious Emery Roth-designed white-glove building, enviably situated near all neighborhood amenities and transportation. Offering an attentive staff, including 24-hour doorman & concierge, elevator operators, and on-site resident manager, The Imperial House has a new state-of-the-art fitness center, parking garage with preferential rates for residents, bicycle storage room, central laundry room, and serene Japanese rock gardens. Pets are welcome.